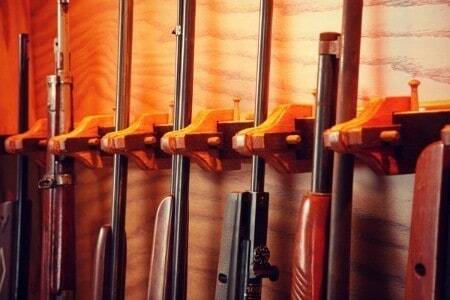 There are a few considerations to make when it comes to the best place to store your guns in your home. 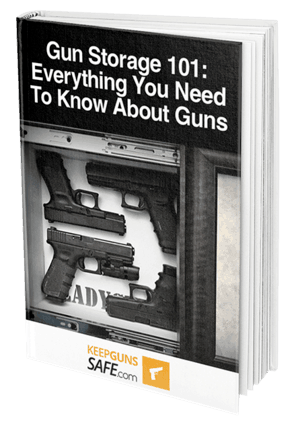 Some gun owners prefer to opt for the safest storage method possible, which would typically consist of a hidden gun safe which may not even be found by an intruder in the first place. If you live in an area where robberies are rare, and you would rather be proud of your collection, you can always opt for a display cabinet instead of a security cabinet. Display cabinets tend to give up a bit of durability and safety in the event of an emergency in exchange for a transparent display for your guns. Keep in mind that most display cases are still more resilient than some might imagine, with tempered glass typically being a minimum for the viewing window. They are still weaker than security cases in most situations, however. Display cases are an excellent choice for gun storage when you have quite a bit of faith in your home's security systems and the safety of your surrounding area. Transparent display cases are typically coupled with guns that hold a degree of sentimental value or for firearms which are rarer and more expensive than your average weapon. A display case can turn a gun which would otherwise go unseen into a conversation piece in the event of a party or social gathering. Gun ownership is often related to a love for firearms as pieces of engineering as well, so it is nice to be able to see your guns as you walk past them and to appreciate their beauty. A security case doesn't allow you to do this without the cumbersome step of having to unlock the door, which is an unfortunate downside. We will now take a look at a characteristic which is crucial when deciding on the best gun cabinet to buy for your home: the matter of size. When you are looking for the ​best rated cabinets for guns ever, the first thing you should consider, more important than any other aspect, is the size. The size dictates exactly what kind of weapons you can fit into the cabinet, and it also dictates where you will be able to fit the cabinet itself. A good step would be to measure the dimensions of the area which you intend to place your gun cabinet before you make your purchase and end up with a cabinet which won't fit. 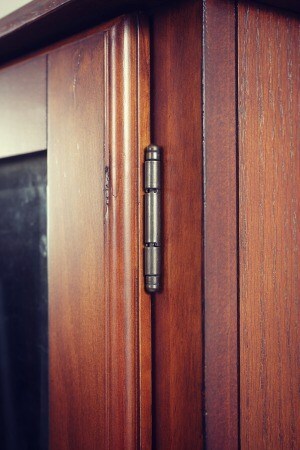 You will also want to verify the interior dimensions so you can be sure that your guns will fit inside of the cabinet. Most full-size gun cabinets will be able to fit long arms up to 52 inches long. Keep in mind that the interior layout of some cabinets can be changed to satisfy your requirements so that the interior dimensions may change from layout to layout. This all goes to show that size should be carefully considered before making your gun cabinet purchase. 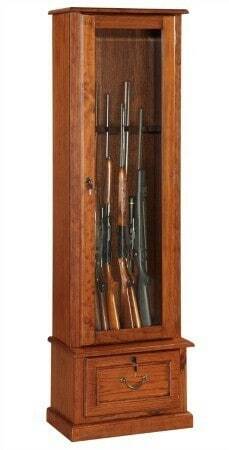 This stylish gun cabinet is manufactured by American Furniture Classics. Featuring a tempered glass viewing window, this gun cabinet is made for those who would like a perfect combination of security and aesthetic value out of their gun cabinet. This product is made out of wood, so it will typically go well with 90% of home decor. If you are looking for a gun cabinet which looks good in addition to keeping your guns safe, you will certainly like this one. It is made to fit most full-size rifles and shotguns, with a maximum length of 52 inches and a felt padded interior to keep your guns in good condition. 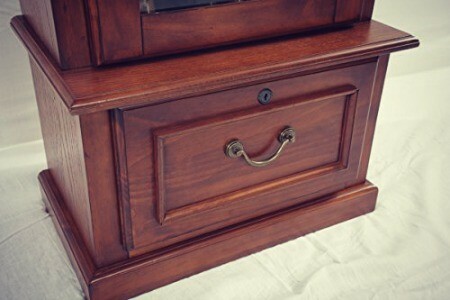 Keep in mind that this gun cabinet is not designed to be as durable as some of the other options you may come across, so it does not feature the same levels of security. Knowing this information, the cabinet is still rather durable thanks to its solid wood construction coupled with a tempered glass viewing window. The cabinet also features a drop down door in the underside which is meant to fit any other gun supplies, such as storage for ammo, cleaning goods, etc. All in all, this gun cabinet is an excellent choice if you don't mind sacrificing a measure of durability in exchange for an attractive design and a transparent portal. Other customers had quite a bit to say about this product. Most customers praised the wooden design for its attractiveness and dark hue. This gun cabinet features a design which can fit into a wide variety of different home styles, so it is versatile when it comes to looking good in your home. Some customers complained about the installation process for this product, stating that it does not include some tools which are needed for assembly. It seems like this may have been rectified since, as our model came included with all necessary parts and tools. This product is typically found for around 170 dollars. This price is quite low when it comes to gun cabinets, with some retailing for 500 and higher. This cabinet is available for sale from several online retailers, including but not limited to Amazon. This American Furniture Classics gun cabinet is a great choice for customers who would like to implement their gun collection into their home decor elegantly and tastefully. We hope that this review has been informative and entertaining. If you have any questions, feel free to leave them in the comments section below.